Stop in for a cup of Joe, a bag of beans, and good eats. Divi Tree Coffee is a family-owned, artisan coffee company fueled by our passion for community connection and our obsession for great, quality coffee, done right. We use the best green coffees on the market, roasted to perfection, and pair them with top quality ingredients to craft the best start to your day. We hope you carry that feeling wherever you go and keep coming back each morning. All around the world, including coffee growing regions, our earth has seen rapid deforestation and pollution. Our business actually has the ability to help combat this and turn it around...if we put our heads and hearts together we can help! Fair Trade works to build an economy that supports a better life for farming families through market access, sustainable and equitable trade relationships, advocacy and consumer awareness. Coffee purchased from certified cooperatives must be at or above the fair trade minimum price set by Fair Trade International. Single origin coffee refers to a single origin as a specific farm or cooperative of farms (who may share milling and processing facilities as well as trading arrangements), or coffee from a single region within a country. This sumptuous blend of Kenyan, Ethiopian & Guatemalan coffee is topped with dark roast Indonesian Sulawesi, adding a chocolatey nuance to a distinguished flavor profile. 15 cents is donated for every pound of Tiger Stripe Reserve sold to IFAW to help protect the greatly endangered Wild Tiger population!!! 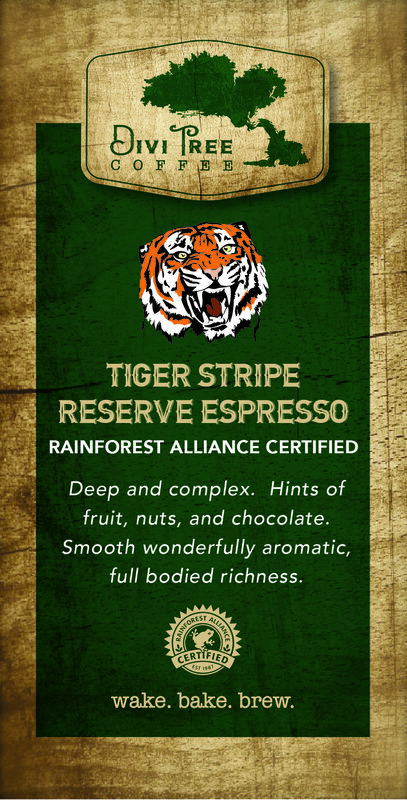 Enjoy the exceptional coffee and help preserve one of the greatest wildlife assets of our planet, all at the same time!